cardigans and kids: some good things & a marshmallow recipe. some good things & a marshmallow recipe. A good friend and her boys needed some comfort snacks - so I finally got around to making marshmallows. 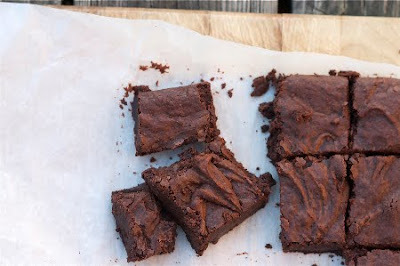 I made Honey and Jam's gooey cocoa brownies Monday night. Quick and amazing I tell ya. Found in "Jam It, Pickle It, Cure It" by Karen Solomon. 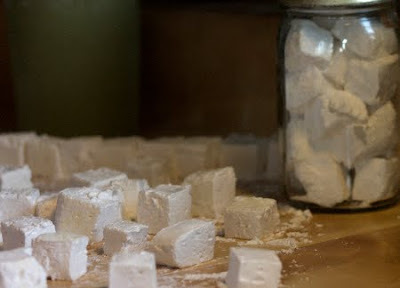 making marshmallows takes a couple of hours-so plan on making them when you have a bit of time. 1. Lightly oil the insie of an 8×8 or 9×6(?) pan with vegetable oil. Generously coat with confectioners’ sugar; set aside. 2. Pour 1/3 c. of the water into the bowl of a stand mixer. Sprinkle the gelatin over the water, and let stand for about 10 min. 3.In a saucepan, (with heat off) combine the remaining 1/3 c. water and the sugar, corn syrup, and salt. Place the pan over medium-high heat. Clip a candy thermometer to the inside of the pan and make sure it doesn’t touch the bottom. Cook the mixture (without stirring it) until it reaches 240 F.
If there is any crystalized sugar on the side of the pan, wipe them down with a wet pastry brush (dipped in water). 4. With mixer on low speed, very carefully add the hot syrup to the softened gelatin. Add the vanilla, increase the speed of medium-high, and beat for 8-13 minutes, until the mixture becomes, white, stiff and sticky. 5. Spread the mixture into the prepared pan using a lightly oiled spatula. With wet hands (I ran them quickly under the faucet or just fill a small bowl with water), press the marshmallow evenly into the pan-as flat as you can. 6. Set aside for at least 1 hour, or until the marshmallows are firm and cool. 7. Sift the confectioners’ sugar into a shallow dish. Run a wet knife around the edge of the cooled pan to loosen the marshmallow. 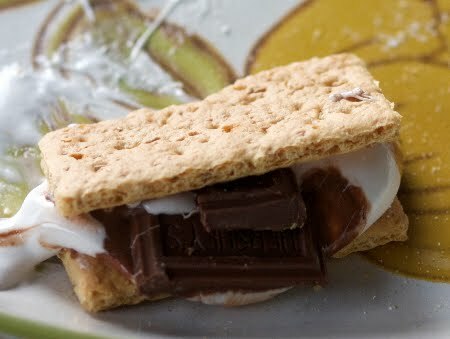 You can remove the marshmallows from the pan and then cut, or cut while they are still in the pan. Just keep rewetting your knife so they will cut a little better. Then toss in the powdered sugar until completely coated. To store, place in a single layer in layers separated by waxed paper. They will keep for at least 1 month when stored in airtight container. *Matheau and I both like coconut, so for some of them, I mixed coconut with the powdered sugar and dipped them that way. You can also mix a bit of cardamon or cocoa powder with the powdered sugar. I really like them with cardamon. Or use food coloring after you add the vanilla (or a different flavor) so they are a different color…. And some non-food related goodness? -I have leather jacket that was one of my Grandmother's, I've been thinking for a while how it would make a really cute purse. After seeing these this morning, I'm sure of it. -Katie is hosting some Do It Yourself projects this month. -And I love Anthropologie, but not in my budget, so these ideas are so inspiring right now.